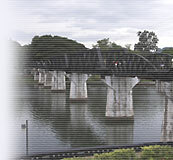 TheRiverKwai.Com - Bridge over the River Kwai. This famous bridge is spans the Kwai Yai River. It was brought from Java by the Japanese Army and assembled at the River Kwai by the war prisoners. Bombed several times in 1945, it was rebuilt after the war. The curved spans of the bridge are the original sections. An estimated 16,000 war prisoners and 49,000 impressed labourers died during the constrution of the bridge and the Death-Railway line that leads to Burma. An epic film based on the true story of prisoners of war in 1943 forced to build the Bangkok-Rangoon railway bridge over the Kwai river in the Burma-Thailand jungle. Filmed in Ceylon, the movie bridge was built in 8 months by 500 workers and 35 elephants, at a height of 50 feet above water and 425 feet long. The real bridge near Kanchanaburi,Thailand, is a different bridge than the movie version. It was built over several months starting October 1942 by slave labor civilians and POWs as part of the Death Railway to supply Japanese troops in Burma from Rangoon. Low to the water, constructed of steel and concrete, the bridge was not blown up but remains today as a usable bridge and tourist attraction. According to survivor Fred Seiker, "The railway was completed on the 17th October 1943 at Konkuita in Thailand, not far from the Three Pagodas Pass. l shall not enter into the statistics or technical data or the final death toll of the various countries involved; these have been extensively quoted in numerous publications, only to state that the railway was 415km long and built from scratch in just 16 months. (A previous assessment, carried out by British Engineers was 5 years.). The total labor force consisted of about 68,000 Allied POWs and 200,000 Asian laborers. The combined death toll was around 96,000, of which 18,000 were Allied POWs. Consider for just a moment how these human beings died, where they died and, above all, why they died." In the movie the story is based on the building in 1943 of one of the railway bridges over the Kwai Yai at a place called Tamarkan, five kilometres from the Thai town of Kanchanaburi. This was part of a project to link existing Thai and Burmese railway lines to create a route from Bangkok, Thailand to Rangoon, Burma (now Myanmar) to support the Japanese occupation of Burma. About a hundred thousand conscripted Asian labourers and 12,000 prisoners of war died on the whole project. Although the suffering caused by the building of the Burma Railway and its bridges is true, the incidents in the film are mostly fictional. The real senior Allied officer at the bridge was Lieutenant Colonel Philip Toosey. Films featuring the Bridge over the River Kwai. Some consider the film to be an insulting parody of Toosey. On a BBC Timewatch programme, a former prisoner at the camp states that it is unlikely that a man like the fictional Nicholson could have risen to the rank of lieutenant colonel; and if he had, he would have been "quietly eliminated" by the other prisoners. Julie Summers, in her book The Colonel of Tamarkan, writes that Pierre Boulle, who had been a prisoner of war in Thailand, created the fictional Nicholson character as an amalgam of his memories of collaborating French officers. The destruction of the bridge as depicted in the film is entirely fictional. In fact, two bridges were built: a temporary wooden bridge and a permanent steel and concrete bridge a few months later. Both bridges were used for two years until they were destroyed by Allied aerial bombing. The steel bridge was repaired and is still in use today.